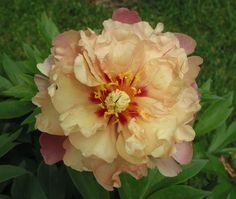 Joanna Marlene is another Intersectional or Itoh peony (a cross between the more common herbaceous varieties and tree peonies) that has earned a spot on my top 10 list. Like other Intersectionals the stems are semi-woody, which means they will stand tall even in stormy weather, but what makes Joanna stand out are the flower's multicolored petals—a kind of Joseph's Coat affect—and the almost magical metamorphosis that takes place as they age. As the flower first opens, petals unfold in vivid shades of lavender, salmon, peachy-gold, red and cream. Over the next few days the colors then shift to softer hues. In full bloom a plant with perhaps two dozen blossoms in various stages will display a striking array of colors. A well-grown Joanna will reach a height of around 30 inches and may have a spread of 3 1/2 feet. When it first emerges from the soil in spring, its stems and leaves are a dark red before transforming to a medium green. Foliage remains attractive right up until fall. It's another creation from breeder Roger Anderson of Ft. Atkinson, WI, and was first registered in 1999.